This is the latest piece Fred has produced, in tandem with the oil painting as mention in our previous news post. 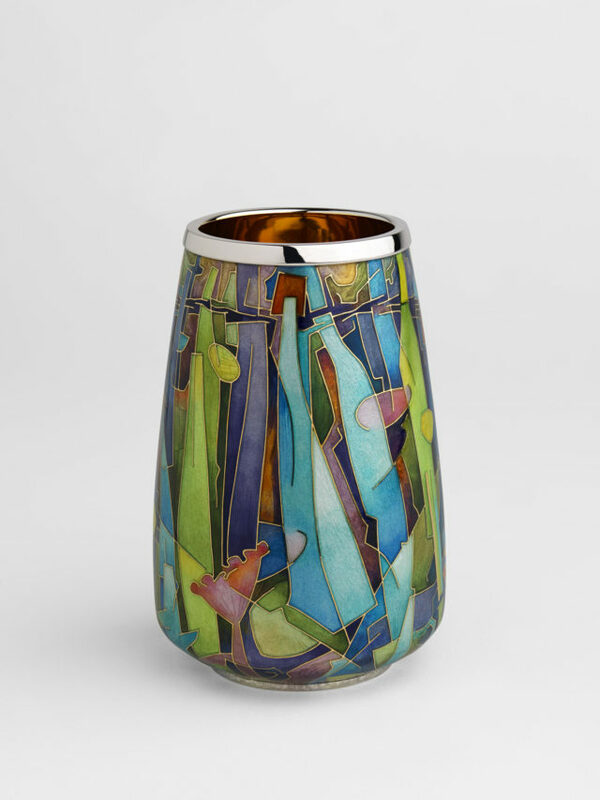 This beautiful silver and enamel beaker is a complex weave of the amazing colours that can be seen in the hedgerows when walking through the countryside. Fred didn’t want to be too pictorial and so this is more to do with veiled details – a tangled mass of nature revealing hidden textures and pattern and colours where you least expect them. The oil painting and enamelled beaker, as artworks, perform perfectly well on their own, and Fred was unsure how they would look together, however we are delighted to say that there is a real dynamic between them and the beaker really sings when near the painting. They will look fantastic amongst the contemporary furniture and silverware at Inspired 2017 from 3 – 6 May at the Goldsmiths Centre London EC1M 5AD.